in the AdSense Help Forum* where you can post questions and share your experiences about multi-screen optimization. In today’s post, we will summarize the top five FAQs received to date. We hope you find these helpful. Optimizing websites for multiple screens requires resources and commitment. Is it worth my time and investment? Yes, going multi-screen is worth your time and investment, although it’s not always something you can accomplish in a day. Our research shows benefits to both monetization and user experience. On average, publishers with mobile-optimized sites can have 8% higher RPM and their site traffic grows twice as fast as non-optimized publishers. ** Having a mobile-optimized site can also help you to improve time spent on site and bounce rate. I’m planning to create a responsive website. How are responsive ad units performing? We’ve found that responsive ad units generally perform better than normal ad units as they work in line with responsive layouts. This helps to improve the experience for your mobile users. We recommend using the smart sizing mode if you’re just starting out, but there‘s also an advanced mode if you're looking to customize ad sizes on a more granular level. You can find code samples for the advanced mode in the Help Center. What are the best practices for mobile site ad placement? The best ad placement will depend on your own site content and structure, but you can see our recommended placements for mobile sites below. We recommend that publishers use the large mobile banner (320x100) and medium rectangle (300 x250) sizes, which are high performing and fit nicely on your mobile screen. What's the maximum number of ads allowed on mobile pages? 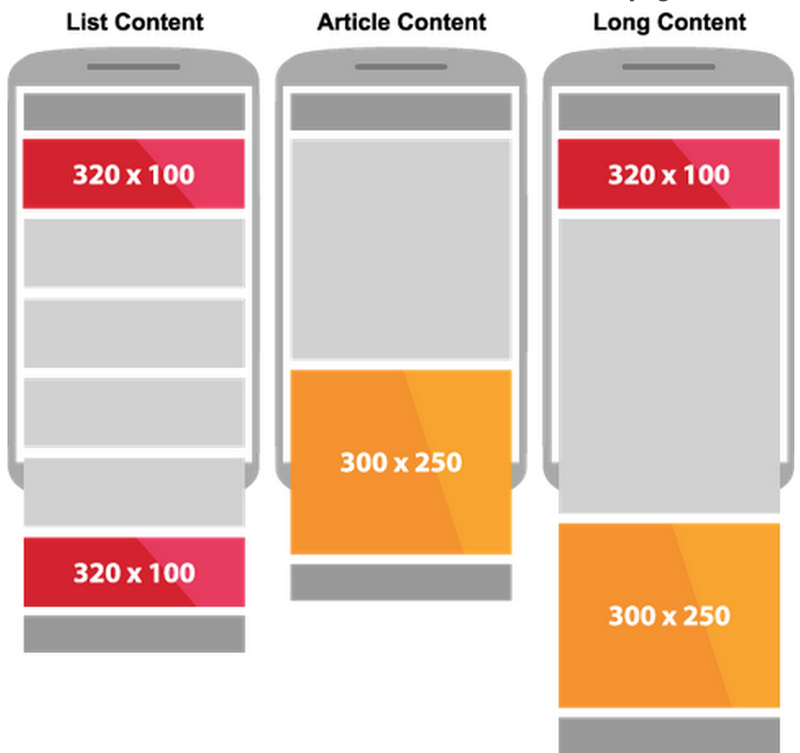 You can place up to three content ad units per page on your mobile sites. This is the same number of ad units allowed on desktop sites. For smaller screens, carefully consider the balance of content and ads so that users can find the information they’re looking for. Please avoid showing only ads on your first screen. How can I improve the user experience on my mobile site? To check your mobile user experience, try the PageSpeed Insights tool and read the suggestions in the user experience section. For more detailed and technical approaches, we recommend you go through the Web Fundamentals resource on the Google Developers site. You’ll learn more about how to deliver your content as quickly as possible, optimize images and videos, and improve the mobile experience for users. If you’d like to see some examples of good mobile site design, check out the white paper, Principles of Mobile Site Design. Still have questions? Visit the forum and start a conversation with other publishers to learn multi-screen best practices. We recently opened a new category called Going Multi-Screen in the AdSense Help Forum* where you can post questions and share your experiences about multi-screen optimization. In today’s post, we will summarize the top five FAQs received to date. We hope you find these helpful.